Testament Winery is the first Swedish winery in Croatia. Our objective is to create Croatia’s best wine. Testament Vänner (Testament Friends) is a wine club for all those who wish to join us on this unique wine adventure. As a member, you will be able to follow our daily work in the vineyard and winery. You will be given special tips and offers, first in line when we launch new products and be invited to wine tastings and exciting VIP events. Needless to say, as a Testament friend, you are always welcome to visit us at the winery. To join, just send us an email – it is free and fun to be a Testament Friend. Yes, I want to join Testament Vänner. 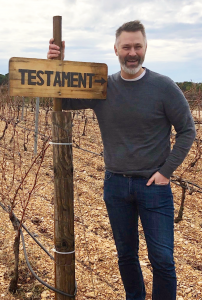 To join the wine club, just send me an email robert@testament-winery.com. Enter you first and last name in the email, and we will take care of the rest! Data protection: your email will be used only by Zhoda Investments to send information from Testament Vänner directly to you. Data will not be shared with third parties. By sending an email requesting membership, you confirm that you are at least 25 years of age.